These types of 'nanobots' are currently being used in humans to target cancerous tumors and can be remote controlled with magnetic pulses or ultrasound after being injected into the bloodstream near the targeted area (usually in oxygen-depleted zones) carrying some sort of drug payload. Magneto-aerotactic bacteria nanobots - "...new nanorobotic agents capable of navigating through the bloodstream to administer a drug with precision by specifically targeting the active cancerous cells of tumours... 'These legions of nanorobotic agents were actually composed of more than 100 million flagellated bacteria -- and therefore self-propelled -- and loaded with drugs that are moved by taking the most direct path between the drug's injection point and the area of the body to cure.'..." 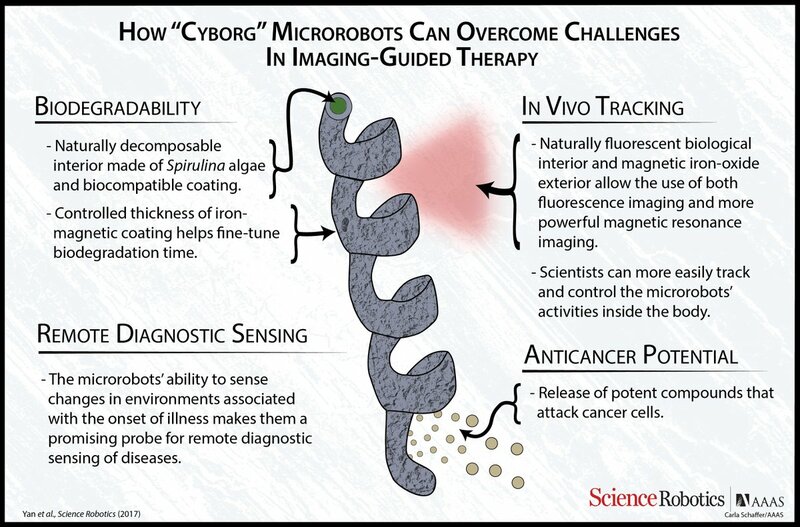 Algal-based nanobots - Another remote-controlled, biodegradable, cancer-killing nanobot, this time made from spirulina algae with fluorescent and magnetic properties for tracking and controlling it to remote areas of the body. DNA-based nanobots - Made of DNA, this creation is capable of performing nanomechanical tasks such as finding, carrying and sorting molecular cargo like chemicals by using their nucleotide arms, hands, legs and feet to perform tasks and move around. They're smart enough to work alongside other bots in the same area without interfering with their tasks and it could be used to deliver medicines throughout the body, transport gene editing tools or for other programmable therapeutics. Bio-based solutions represent a bulk of the nanotech in this category and scientists believe that these types of bots could eventually be programmed with as much detail as full sized mechanized robots. However, researchers are also exploring nanobots made with electronics, such as 'neural dust,' which is perhaps best described as a Fitbit for the nervous system. Created from CMOS circuits/sensors, neural dust uses ultrasound to power a 3mm-wide implant that can wirelessly track and transmit real-time data from nerves, organs and muscles. Development of neural dust took rise with funding from DARPA and a 2013 UC Berkeley paper (PDF) titled "Neural Dust: An Ultrasonic, Low Power Solution" conceptualizes a mature version of the technology, which could be used to create an implantable brain-machine interface with ultrasonic sensors that can stimulate specific brain areas. Our bodies are quite permeable by ultrasound and DARPA envisions that ultrasonically powered brain implants with biosensors may one day be used to monitor health and regulate bodily functions ranging from bladder control to the movement of prosthetic limbs, eventually enabling 'self-healing' of the body and mind through so-called 'electroceuticals'. Before neural dust, DARPA financed research through Berkeley in 1998 to create 'smart dust' -- technically known as 'microelectromechanical sensors' (MEMS) -- which is essentially an IoT device that can be placed anywhere in the environment to wirelessly monitor changes such as light, vibrations, temperature, humidity, magnetism or chemical signatures, acting as nerve-endings in an ad-hoc distributed network that provides full-spectrum intelligence. 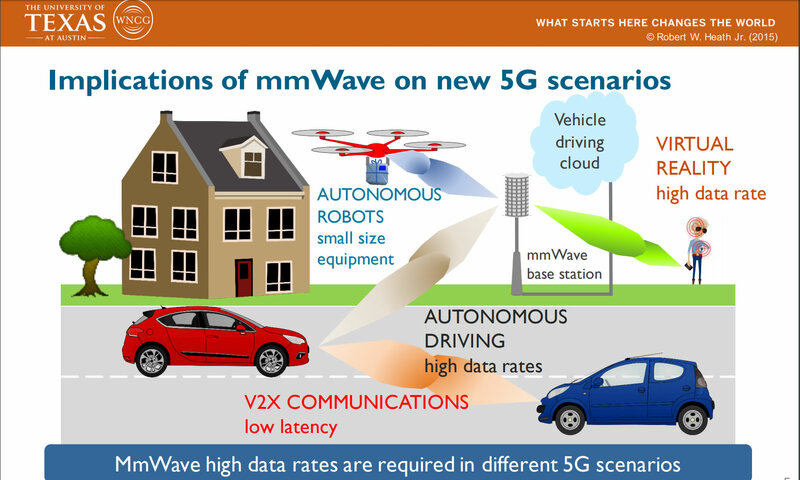 Rolling out over the next few years, 5G is expected to transform the world with ever-present wireless connectivity that will enable a smart grid of IoT devices comprised of nearly everything on earth, which could eventually facilitate an 'intelligence' that runs alongside everyday life, monitoring and reacting from a smart city's central autonomous control center. Google, Facebook, Qualcomm, Verizon, AT&T, Nokia and Samsung are some of the companies contributing toward the 5G network, not to mention interest from governments around the globe. China, Japan and South Korea are currently leading in the deployment of 5G while the US and Europe are lagging behind, with projections for a worldwide network by the early-mid 2020s. 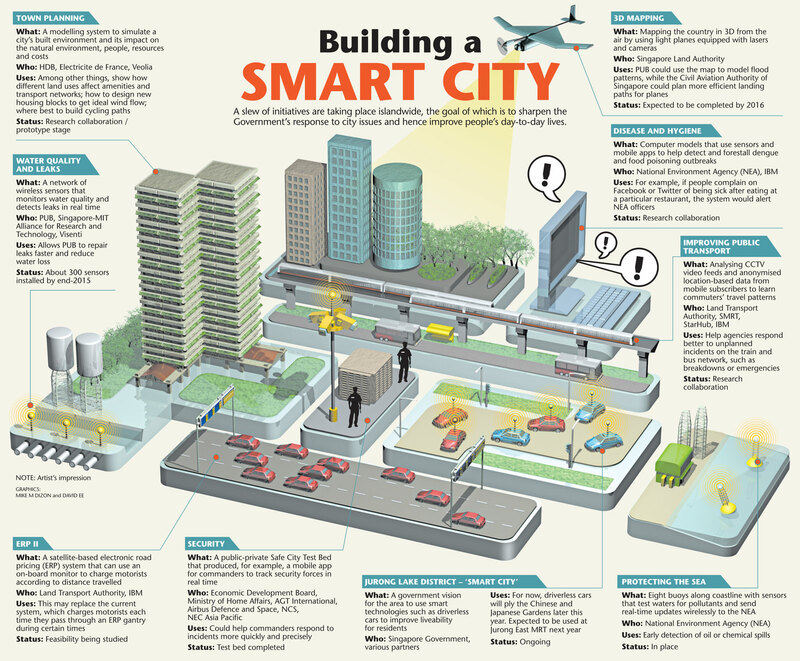 Planned for meeting global sustainability goals, 5G-connected cities pave the way for technologies such as autonomous drones, self-driving shuttles, always-on IoT sensors and biometric identification. Transportation could be intelligently directed in real-time according to traffic levels and environmental conditions, predictive surveillance cameras could report suspicious activity before crimes actually occur, while every morsel of data could be collected, analyzed and used for the betterment of all. Cisco is a prime example of organizations focusing on technologies in this realm. The company has been speaking about the 'Internet of Everything' (IoE) for more than a decade and was recognized as the "#1 Smart City Supplier" in a 2017 report by Navigant Research. 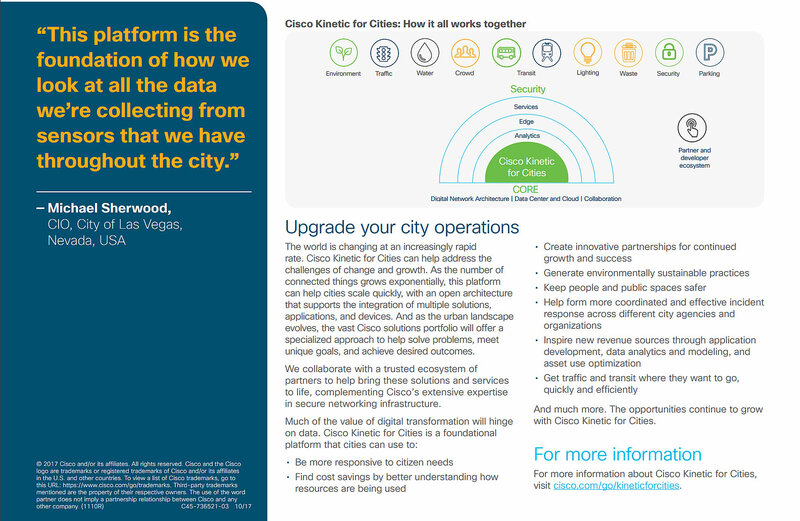 Since 2015, the company's IoT platform "Cisco Kinetic" has been adopted by cities including Copenhagen, Paris, Kansas City, Las Vegas, Schenectady, New York; Adelaide, Australia; Budapest, Hungary; Dubrovnik, Croatia; Trencin, Slovakia; as well as Bangalore and Jaipur India. Cisco Kinect is one of several unified IoT platforms being purpose-built to extract, compute and move data to the right place at the right time in a given ecosystem. By actively extrapolating and applying rules to information, these platforms can provide horizontal data aggregation and act as a multi-cloud, multi-party, multi-location 'IoT data fabric,' which is useful for furthering smart city initiatives and driving better business outcomes. 'Alibaba City Brain' in Hangzhou, China - Created in collaboration with more than a dozen companies including Foxconn and HTC, Alibaba's Brain 1.0 uses deep-learning and AI to track commutes, purchases, social media and other interactions for optimizing city functions such as managing Hangzhou's traffic lights to keep transportation moving and accidents down, or identifying potentially criminal behavior. Neom in Saudi Arabia - Expected to span 10,000 square miles (25,900 square kilometers) along the coast of the Red Sea toward Jordan and Egypt, investors around the globe have committed more than $500 billion dollars to build Saudi Arabia's city of the future. Neom will have its own governmental framework and will be powered by technologies such as renewable energy, high speed wireless connectivity and artificial intelligence. The project is viewed as a new economic-development engine that will fuel innovation in bio-tech, manufacturing, and media. Sidewalk Labs' 'Internet City' in Toronto, Canada - Google sister company Sidewalk Labs won a competition to test and install the company's smart city technology as a redevelopment project for an 800 acre parcel, which will be known as Quayside, on Toronto's Lake Ontario waterfront. The area will be built with emerging technologies like self-driving taxis and buses, smart street lights, modular buildings and environmentally managed outdoor spaces to mitigate the weather and maximize being outdoors. Garbage trucks will also be replaced by autonomous vehicles moving garbage through underground tunnels. Smart Nation Platform in Singapore - Being an island nation that is essentially a large city, Singapore has taken the unique opportunity to become the first 'smart nation,' connecting all traffic management, elder monitoring, air quality control, and citizen services. The country is calling it a "national operating system" for 100 million objects and a 'city brain' can provide real-time monitoring data to a central graphical dashboard where admins can visualize a myriad of metrics from millions of sensors. Belmont, AZ - Purchased by one of Bill Gates' investment firms for $80 million, Belmont will cover 25,000 acres of Arizona that is currently unoccupied, with enough land to be allocated for 80,000 residential units as well as 3,800 acres for office, commercial and retail spaces, and 470 acres for public schools. Emphasizing high-speed networks, advanced manufacturing, self-driving vehicles and data centers, Belmont could become a hub for new technologies to thrive and a proposed I-11 freeway would connect Belmont to Las Vegas, Nevada. Nvidia Metropolis - Working with Alibaba, Huawei and others, Nvidia is creating an edge-to-cloud video platform that includes tools, technologies and support to build smarter, faster AI-powered applications for everything from traffic and parking management to law enforcement and city services. The company's Metropolis Software Partner Program brings together a dozen software partners to offer a curated list of applications that make it easy for systems integrators and hardware vendors to build new products. One of those partners is SenseTime, a facial recognition solution for public safety, retail and access control.